MS0109 – HOODED JACKET and PANTS SET – KUUS Inc. 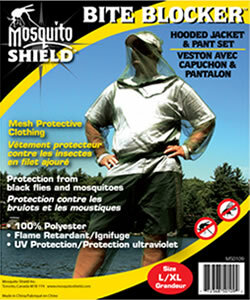 Innovative, full body apparel, for the ultimate mosquito protection. Provides UV protection and repels mosquito’s, deer flies, black flies and other insects. Available in two sizes: Small and Medium. Jacket and pants available separately or as a set. Jacket comes with a hood to protect your face. Become invisible from bugs. 100% Polyester. Flame retardant.